If you're buying an LED lightbulb, you often have to pick between splurging on a fancy one or saving money by buying whatever's cheapest. Cree's original LED bulb is one of the rare LED lightbulbs that works well and costs next-to-nothing, and now the company is offering an even cheaper version. For less than $10, you can get yourself a truly high-caliber LED bulb that'll last for 25,000 hours. That's nearly three years constantly turned on. That's a good deal. If you have a dimmer, it works with a dimmer. The new version of the LED bulb looks so much like an incandescent light that when I tore open the box, I thought it was (I'm reviewing a bunch of lightbulbs right now so I wasn't paying attention to which one I was opening). The only somewhat quirky design was a sort of gilled look at the bottom of the bulb. When you screw it in, it continues to look like an incandescent bulb. I tested the 60 Watt "Soft Light" version, and it was plenty luminous; I can't imagine wanting a brighter bulb in my house. Unlike the original Cree bulb, there was no weird ridged ring that made it hard to screw in. I never used the original bulb for very long, so I can't say how much better or worse this version is. I can say that it is a very good LED bulb, and after using it, I'd buy it over the original Cree. It's 20 percent cheaper! And, according to Cree, it's an improvement over the original, since the company removed the metal heat sink that comes on the old version. I've never given lightbulbs much thought until I started reviewing them here, and I'm not exactly a LightBulbHead or whatever the preferred nomenclature is for the bulb enthusiast community. But I got genuinely excited about this bulb because it's really cheap, it works well, and it doesn't need to be replaced for a long time. 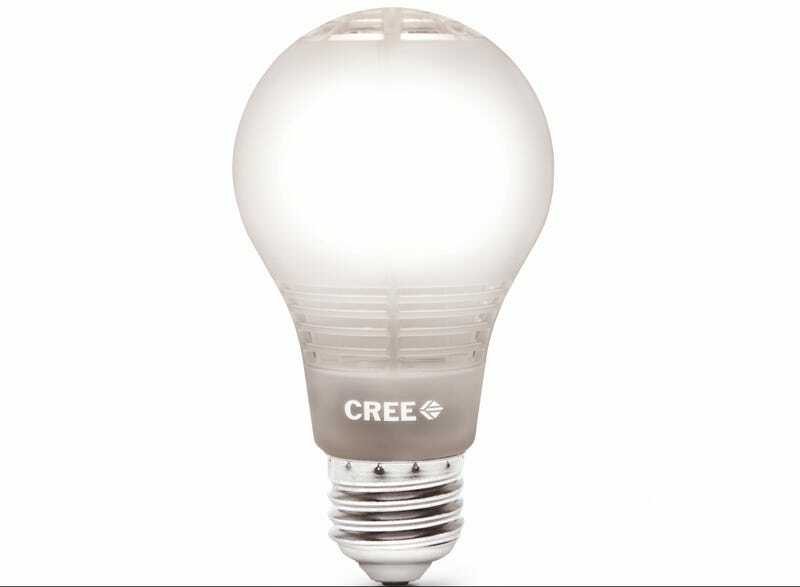 If you want to pick a Cree LED up, you can buy the new versions online at Home Depot today, and they'll be in Home Depot stores starting in November.